If a tree falls in the (Canadian) woods does it make a sound? Driven by the appeal of building the structure where it wouldn’t be found and the lack of funds to purchase land, Allen stealthily built the egg-shaped tree house on nine acres of Canadian government-owned forest in the backwoods of Whistler. Allen left his software development job in hopes of a creative path to retirement. Without a design, engineering or architecture background, he took on the task of teaching himself the carpentry and design skills needed to land a job in custom home building—and to craft HemLoft. What started off as a labor of love—fulfilling Allen’s dream of “building something cool” — now is receiving international attention. The secret venture included finding $10,000 worth of needed materials on Craiglist, then sneaking in said materials at night—all while Allen was living out of his car. 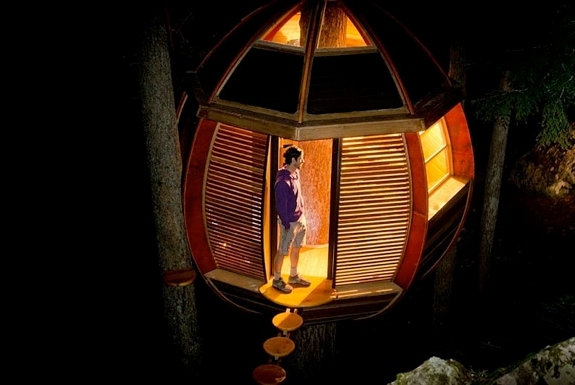 It took roughly two years—partially due to construction costs–to build the 100-square-foot orb. After its completion, Allen and his now-fiancee spent just a week living there before heading out on a cross-Canadian trek. Yet, before he started the trek, he shot numerous photos of the unique design — hatched by Allen with several friends who were recent architecture school grads. When others saw those images, they encouraged Allen to tell the story of his secret (albeit illegal) project. In keeping with Allen’s quirky spirit, he’s putting the choice to the public and asking people to vote on his website as to the tree house’s fate. There, he offers four choices: attempt to purchase the nine acres of land (and the tree that houses his egg) from the government, make it a geo-caching game, turn it into a public campsite or take it down. The public has suggested a number of creative alternatives, including moving the structure to Whistler museum. Though the evolution of the HemLoft started with a desire to retire and neither funds nor land, Allen’s fans are now vying for a HemLoft of their own. But building a tree house on legitimately-owned land isn’t quite Allen’s style. He’s accepting donations on his website for his next project — a new, valuable creation that doesn’t belong to anyone.